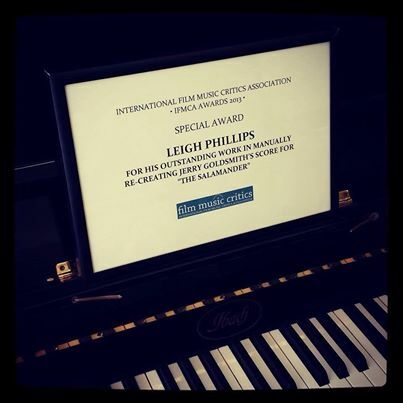 Composer orchestrator and conductor Leigh Phillips has been presented with the IFMCA Special Award by IFMCA member Ley Bricknell. 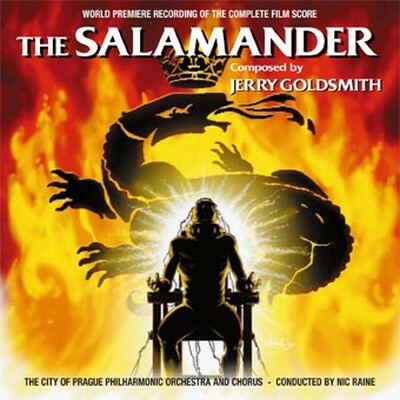 Phillips was recognized for his outstanding work in manually re-creating Jerry Goldsmith’s score for The Salamander for its re-recording by the City of Prague Philharmonic Orchestra, and subsequent premiere release on the Tadlow Music label. This recording of The Salamander also won the IFMCA Award for Best Archival Release of an Existing Score – Re-Release or Re-Recording, with the named recipients being conductor Nic Raine, album producer James Fitzpatrick, liner note writer Frank K. De Wald, and album art directors Paul de Blieck, Johan van den Broeck and GINKO DIGI. This is only the third time in IFMCA history that a special award has been presented. The first time was in 2007, when composer Marc Shaiman and lyricist Scott Wittman were recognized for their outstanding work on the screen musical Hairspray, based on their own Tony Award-winning stage show. The second time was in 2011, when composer Christopher Lennertz received the award in recognition of his charity project, A Symphony of Hope: The Haiti Project, which was conceived to raise money for the victims of the 2010 Haiti earthquake. The Salamander is a 1981 film directed by Peter Zinner and starring Franco Nero, Anthony Quinn, Martin Balsam, Sybil Danning and Christopher Lee. In it, Nero plays Carabinieri Colonel Dante Matucci, an Italian police detective investigating a series of murders involving prominent politicians, and which may be linked to a plot to seize control of the government. Following it’s initial recording, Goldsmith’s score was never archived; as a result, it represented one of the most clear “missing links” in Goldsmith’s recorded filmography, having never been released in any format. When James Fitzpatrick of Tadlow Music contacted Leigh with a view to to re-constructing it, the Goldsmith expert and enthusiast didn’t hesitate in accepting the challenge – but, with none of the music available, Phillips was forced to watch a European DVD of the film and painstakingly put the score together by ear. Leigh’s talent and discipline for this kind of job was recognized by the International Film Music Critics Association as an outstanding effort in preserving this superb Goldsmith score. Leigh Phillips was born in South Wales in August 1973. He is known for producing music scores for animation, short features, documentaries, theatrical productions, television promos and feature films; his collaborators have included composers John Ottman and Joe Harnell, the Halle Orchestra, the Golden State Pops Orchestra, and soundtrack producers Silva Screen Records and Tadlow Music, while his orchestrations and arrangements have featured in productions by companies such as Decca Records, SKY, IMAX, ITV, Channel 4, Prometheus Records, Classic FM and the BBC. 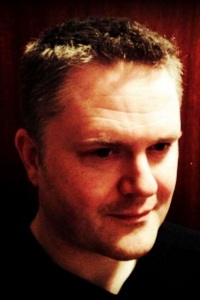 In addition to his work on The Salamander, Phillips has also been involved in score reconstructions of the scores for The Blue Max by Jerry Goldsmith, Exodus by Ernest Gold, Lawrence of Arabia by Maurice Jarre, Conan the Barbarian by Basil Poledouris, Conan the Destroyer by Basil Poledouris, and Quo Vadis by Miklos Rozsa. 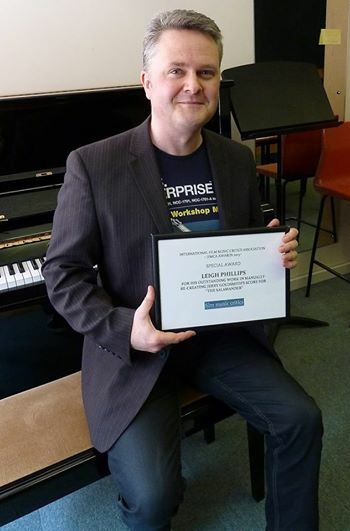 This presentation took place at the London College of Music where Leigh tutors both undergraduate and postgraduate film-music composition students.